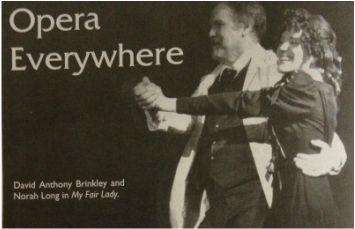 Few would dispute that My Fair Lady is one of the great American musicals. But a great production, like the one at Chanhassen Dinner Theatres, in suburban Minneapolis, grants it new life. In a nine-month run of performances that will finish in late January, artistic director Michael Brindisi has re-imagined the work, shaking off the dust of convention and letting its greatness shine. Harking back to the original myth, designer Nayna Ramey's set is a Greek temple, a series of marble columns and platforms, pristine in their simplicity. The Victorian furnishings slide in and out effortlessly, allowing the production to develop real momentum. and Higgins asks about his slippers, he condescendingly offers her a chocolate, as he did frequently during their training. Far from being cowed, she breaks one in half and offers part to him, as he had done on her first visit. This was an Eliza who had become every bit Higgins' equal, raising interesting post-curtain possibilities. Norah Long was born to play Eliza Doolittle. Her comic timing made the most of the Cockney's outrageousness, and her dramatic flair made the transition to strong lady eminently believable. Her strong, pure soprano was beautifully attuned to 'I Could Have Danced All Night'; it was breathtaking. David Anthony Brinkley was a Henry Higgins who could actually sing the music. And with that, he transformed the character, softening his edges and giving him added humanity – a romance with Eliza became a plausible prospect. Jonathan Rayson was a charming Freddy, dashing and silly by turns, with a warm tenor that soared thrillingly through the heights of 'On the Street Where You Live." The only blemish was an inconsistent accent. Standouts in the strong ensemble were Chanhassen veterans Henry Gardner and Katherine Ferrand. No one plays drunks better than Gardner, but he was all spit and polish as Col. Pickering. Ferrand, Amanda in Private Lives nearly two decades ago, brought the same Cowardesque panache to Mrs. Higgins. One can only wish that all productions of musicals (and operas too, for that matter) could radiate this much wit, intelligence, and respect.